Earlier this week I learned that ParmaDaze favourite, the Hotel Albion has recently rebranded and now goes by The North Port Hotel. A bit of a shame, I thought, but as Melbourne already has The Albion Hotel and The Albion Rooftop to contend with, one less Albion in this city will probably make things a little less confusing. Then about 3 hours later I found out about the newly opened Albion Pizza in Brunswick West. You may be forgiven for thinking that Albion Pizza is just your standard take away pizza joint, because from the outside that’s pretty much what it looks like (and even on this inside that is essentially what it is), however rather than just go the take out route they have also put in some tables, and you have the option to tuck into their menu on plates in the store as well as in cardboard take away containers. It’s a cosy spot for a feed, decked out with care and its a bit of fun to kick back and watch the take-away pizza construction line in action. Not the most robust parma menu we’ve seen, but always nice to have a choice. The table was pretty split, half going for the bolognese and half going for the traditional parma. Now I have some bad news. Are you sitting down? You should sit down. As it stands, Albion Pizza does not serve alcohol. Are you okay? Can I get you anything? We asked as we were ordering and they are working on their liquor license, but as they are still relatively new it’s not quite ready yet. At the moment Albion Pizza’s fridge contains naught but soft drink, San Pellegrino, juice and water. A beer would have been lovely, however there is an IGA Express with a bottle-o next door, so if you are taking away you can grab a six pack there to enjoy with your parma while you sit at home on the couch. I mentioned earlier that, being a pizza place, we had a front row seat to the pizza oven and all of the pizzas being made as we ate - What surprised me was seeing our cooked schnitzels emerge from the kitchen, get sauced and cheesed and sent straight through on the pizza oven conveyer belt to get browned off before being plated and served. It’s kind’ve obvious that they would do this but it’s just something I’d never considered before… Is that interesting? I found that interesting. For an $18 parma I was surprised at the quality of the schnitzel. We were greeted by a thick, chunky schnitzel. Unprocessed chicken breast and not over-crumbed. There was some slight burn on the bottom of the schnitz, but nothing too bad. Internally the chicken was well cooked, plump, juicy and overall a solid foundation to the toppings above. Now as I said I went for the bolognese parma, but also did a bit of a tradeoff with one of the review team who got the traditional so we could all get an idea of what both topping options tasted like. Both had fantastic coverage of cheese, quality melt with a good stretch and grilled to a lovely golden brown. I think of the two I preferred the bolognese, the napoli sauce was fine but the bol gave it that extra burst of flavour that the other was lacking - To be honest I’m surprised (being a pizza place) that the traditional didn’t have some shredded ham thrown in the mix to differentiate it from the bolognese a little. I think that would have given it that little extra something (perhaps inspiration for a future novelty option? Hawaiian parma with shredded ham and pineapple? … You’ve got all of the stuff there, might as well chuck them on a parma!). Our love of Bad Boy Chips is well documented at this point. Bad boys on their own are top tier, but when they are cooked as well as they were last night and topped with a liberal dose of spicy seasoning (possibly barbecue or even a Mexican spice?) it brings them to the next level. Absolutely outstanding. The salad was okay. Standard garden salad with a healthy dollop of French dressing. It was fine, fresh and inoffensive, but didn’t really wow us in any way. A good palate cleanser from the parma but not too much more. As far as value is concerned the parma at Albion Pizza is outstanding. $18 is bargain basement prices these days and to get a high quality feed with some of the best Bad Boy chips we’ve come across in a long time is a fantastic surprise. You’d be hard pressed to walk away hungry from this one and at just $18 it won’t break the bank either. 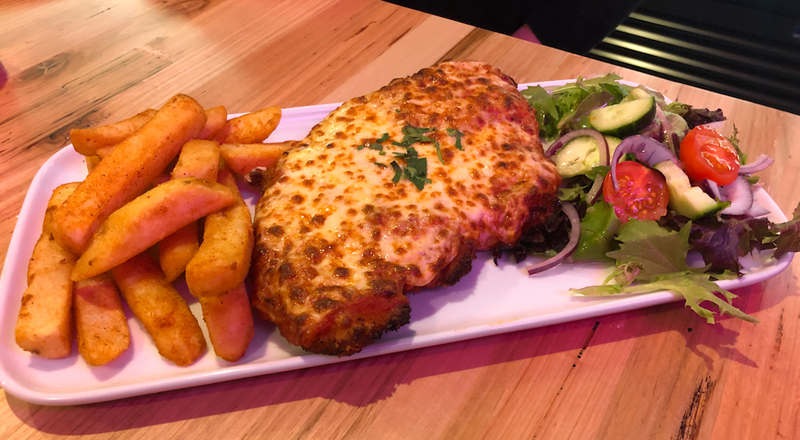 This is a fine example of a parma that I recommend you either get delivered or head in and try if you live in the area (I think dining in would be the optimal experience) and once they get the beers flowing it will be even better. Worth a visit.